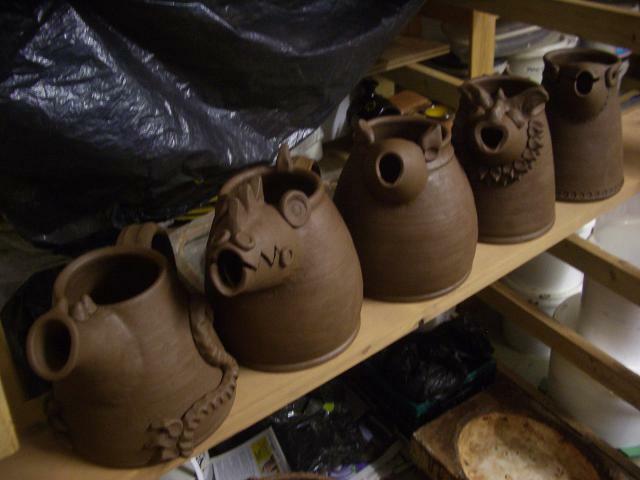 Dragon jugs have been headed and handled today. I was chatting to Amanda the other day about how fun it is to make mad stuff but really what do we do with them afterwards. There are not that huge a number of people who will actually want them and would honestly want to buy them. You have to do it though sometimes. Let the madness out? The pots feel really light in themselves, I may well have done my typical January thing of coming back to throwing and getting so much out of the clay that it’s then too thin to support itself through the slipping process. I seem to do that regularly at the start of the new years workings. It’s been another snowy weekend here though today it has been torrential rain all day which landed on top of the compressed snow that was covering the roads – mmmmm lovely traveling conditions. No cycling to work today for me. The kind people at H is For Home asked me to write a blog post for them, they posted it last friday, you can read it here. Thank you to Justin and Adelle. You might have read about it on Christine’s site but there is an online gallery that has an entry from both of us in a competition that is is running. Vasefinder International 2011. I was walking at Kirroughtree forest yesterday while Paul and his pals were cycling there. 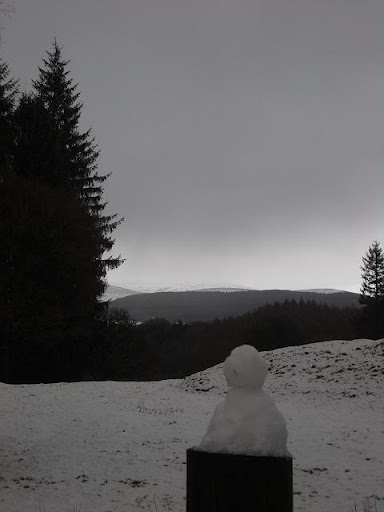 There may well have been an infiltration of tiny snowmen topping signposts around the place, some hat tiny leaf hats and some had what stones I could scavenge for eyes. I think there were a dozen but I did lose count after a while. Occasionally I think I was spotted, heaven knows what the other walkers thought. This entry was posted in dragons, jugs, Kirroughtree, snowmen. Bookmark the permalink. I do love your annual snow angel, Hannah. January is a great time for making pots just because you want to make them. I've been throwing 10 and 12 lb jars that will cost too much to fire,few people will have a place for and I won't want to drag around to shows.Of course , I'm making them anyway.If a dragon invades the yard I,ll have something to hurl at it. Not your dragons of course,I expect I could just give them a cake and send them on their way. I love these Dragon pots and they make me want to make something completely whimsical.I was also wondering what you sent off for the "Tea Party" Exhibition, I delivered my pots to the gallery last week and enjoyed the time out of the studio, and went home via Pilling. 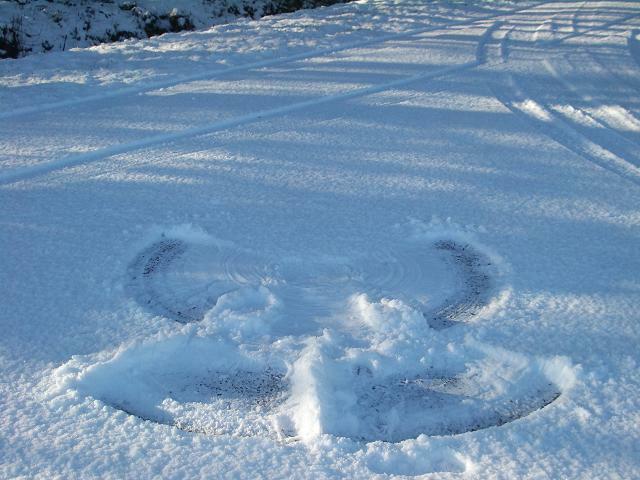 cute and I love the snow angel as well. The dragon pots might just be a testimonial to "do what you love and the money will follow." We have an event in Atlanta called Dragon-con where I'd bet you would sell everyone and take orders for more.Have fun. You could fill the Dragon jugs with madness and then pour it over the last of the mince pies!! Thanks Hollis! It's hard to resist really.Dennis, indeed the big scary dragons may need something large to be thrown at them to scare them off (not to hurt them necessarily, they don't know that they frighten us so much) I tend to just hide behind trees for those ones, they are easily confused so that's always a useful trick. The tiny ones do love their cake. If you let them though they'll devour the lot and then they get tunny aches so you have to be firm but gentle with them. Hi Joseph, I sent some oak leaf cups and saucers and jugs to the Tea Party show. I hope it goes well there.Thanks Garry and Lori, fingers crossed they come out well. Maybe I should plan to bring some on the American tour in April.Anonymous, they are already full of madness, not sure they can hold any more!